SINGAPORE - 10 August 2018 - SolBridge International School of Business, of Woosong University in South Korea, has signed an MoU with PSB Academy, to offer third year Bachelor of Business Administration students from Solbridge in South Korea, opportunities to study abroad in PSB Academy in Singapore for a year. This partnership will also allow SolBridge students to articulate into PSB Academy's University of Newcastle, Australia, University of Wollongong, Australia and Coventry University, United Kingdom undergraduate courses in PSB Academy as a 4-year dual-degree pathway. The two institutions hope that the milestone collaboration will give students ample opportunities to develop cultural fluency for effective leadership, and that it will facilitate greater student access to international networks and expertise in different business specialties in the region. SolBridge's undergraduate courses, which are accredited by AACSB, the Association to Advance Collegiate Schools of Business, already integrate a strong knowledge of Asian economies and their evolving influence on the rest of the world, with in-depth exposure to Korean, Japanese or Chinese languages as part of their curriculum. 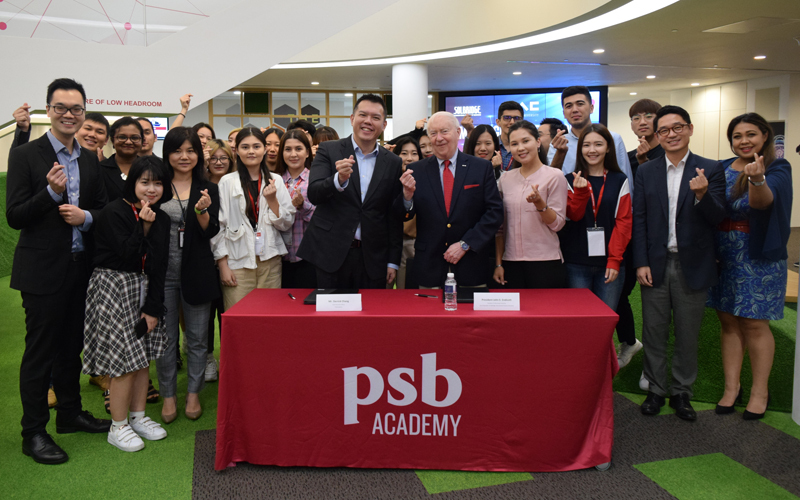 "PSB Academy already hosts students from over 50 nationalities, and with their extensive network of university partners from the UK and Australia, and corporate partners from the region, they will serve as an effective platform for students of both institutions to gain global perspectives while interacting, studying and interning together." "We have sought to participate in and support international activities that will help in the creation of a fortified community of leaders in Asia--and are glad our newfound partners in PSB Academy subscribe to similar progressive models of education that would encourage mutually productive learning and help students develop a deep appreciation for cultural diversity," says John E. Endicott, President, SolBridge International School of Business.